Kimberly by Envy is a swishy, fashion-forward bob with side swept bangs and a 100% hand-tied cap and lace front. 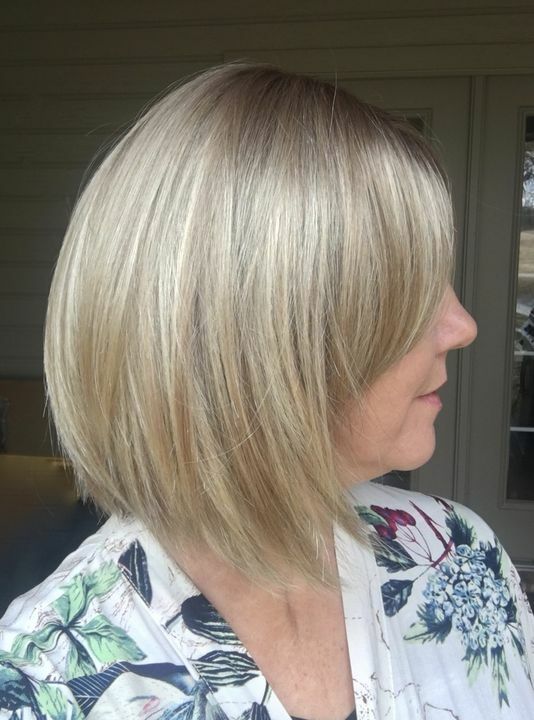 - Bang 7", Crown 6", Side 9", Nape 3.5"
Kimberly by Envy is a modern, sleek, angled bob with side swept bangs that make this style fresh and flattering. She features a 100% hand-tied lace front that creates the appearance of a natural hairline, and a 100% hand-tied cap that is comfortable and provides natural movement in the hair. I love the length and shape of Kimberly and the slightly ragged/blunt ends. I got the Amaretto Cream color and am very happy with the amount and placement of the highlights and the shades used. It might be too extreme for some people but I wasn't looking for subtle. The hair fibers are a bit coarse, which I like as it seems more natural than something silkier and straighter (such as Carley by Envy, which I got at the same time as an alternate to Kimberly). Kimberly was parted in the middle from the manufacturer. I thought I would like the center part, but decided it was a little stark so I changed it to the side. I used the Jon Renau steamer to help establish the new part and to train the bangs out of my face. They still fall in my face a bit, but flipping them back gives me something to do with my hands (kidding/not kidding). Kimberly has a lot of coverage, which will be great if you do not have bio hair (as I do). The lace front extends to the ears. The ear tabs have a beige plastic (or something) underneath, which will not be a problem if they are laying against skin. My bio hair is very dark brown with some gray, so I was concerned the beige would show against it. The lace was definitely visible against the hair. I alleviated both concerns by trimming away the lace on the ear tabs and sideburn areas and coloring in the beige material with a black Sharpie. Joann C. Reviewed by Joann C.
I really like the style and color of this wig. I found though that it had a lot of fly away ends in the back and it was parted straight down the middle. Trying to move the part so that it stays. The ends at the back were very dry also. I could have returned it, but I like the stock picture and am determined to get it right! Elena B. Reviewed by Elena B.
Zanetta B. Reviewed by Zanetta B.
I purchased Kimberly in Sparkling Champagne mostly to try a new shade of blonde. It's an incredibly beautiful color. Everyone compliments the style and color. The hair fibers are silky and weightless where they should touch the back of my neck but I couldn't feel them...at all. I had a bit of trouble with the part being poker straight down the middle and it is a mono top which would allow for parting anywhere. The cap was ear to ear lace front which was a first for me. The completely hand tied cap gives natural movement. There was a little bump/point at the top where the lace meets the fabric of the cap. I believe this would not be a problem on someone with a normal size head but I am so petite that any wig of average size gives me a lot of extra cap room. I wouldn't hesitate to buy again and am anxious to try other pieces by Envy. They also have the most adorable packaging I've ever seen!